feeling stitchy: This is knotty! French knots!, originally uploaded by appleblossomfl. Nothing stitchy makes me happier than when people use French knot as a filling stitch. Like in this mermaid from appleblossomfl. That takes patience! But I think it is always worth it. See the whole mermaid here. HOLY COW!!! Thanks so much for featuring my mermaid!!! It did take quite awhile to do, but I LOVE the way it looks! 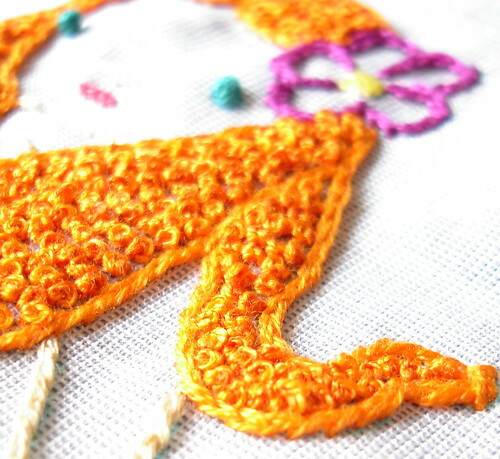 I love the look of a whole bunch of French knots too! I find them really fun to do. That is very pretty, french knot is one of my new favourites stiches. I love the unexpected use of French knots too. Nice work! Embroidery require time,patience and delicacy. You seems to me a women full of Love and delicacy. You have made wonderful things for childrens and i am reading and keep watching your blog. Thanks for posting your work for us. I love the texture that french knots create when there is a whole load of them. My daughter would love this. Wow that is sooooo much work but what a great finished project! A Little Time with Mistress T.